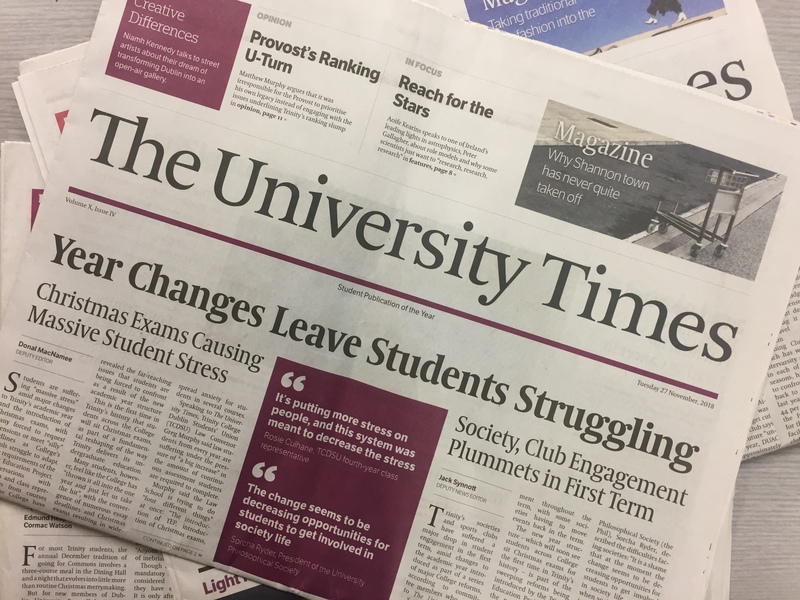 On March 15 2019, the University Times published an article alleging the Knights of the Campanile were implicated in an on-campus hazing evening. On March 19 2019, the newspaper published a note to its readers about its reporting methods, in particular their decision to enter a student residential building, listen to what was said within one student’s residence, and deploy a device outside the residence to record what was said inside. The note concludes that standing precedent in the Irish courts, such as the Cogley v RTÉ case, protects the rights of journalists to conduct such a recording when the matter is in the public interest. This would be huge, if true. Journalists could invoke the public interest to set aside all other legal and constitutional rights. College officials in their offices, academics meeting students, students in their residences: all would be legally powerless to prevent their conversations and activities being covertly, or indeed openly, recorded if a public interest were involved. This in turn would encourage journalists to constantly push out the definition of public interest, forcing others to embark on costly legal proceedings to protect their rights. Unsurprisingly, this is not the legal position. The purpose of this article is to set out our shared view on what the law permits in these circumstances. While newspapers should of course seek professional legal advice to guide their activities, the broader College community should also have some sense of their legal and constitutional protections. In the interests of full disclosure, one of us has assisted one of the students who was subject to the recording that has prompted the current debate. In Cogley v RTÉ, the plaintiffs urgently sought a prior restraint order – an order restricting publication or broadcast, before a full trial has taken place – to prevent RTÉ broadcasting a programme that made very serious allegations about how their nursing home had been operating over a long period of time. The owners of the nursing home argued that the broadcast should be restrained because journalists had entered their property as trespassers and key aspects of the programme contained secretly filmed footage that, they alleged, breached their right to privacy. Mr Justice Clarke in the High Court held that the owners could not rely on the privacy rights of the residents whom they were alleged to have abused; the programme-owners were taking steps to conceal the identity of the residents. The filming of the plaintiffs and their employees did, however, amount to a breach of their own privacy rights. Nevertheless, before the Court could grant a temporary injunction, it had to consider both the public interest in publication and whether the owners could be adequately compensated by an award of monetary damages after a full trial. Mr Justice Clarke held that issues of “very significant public importance” and “legitimate public interest issues of a very high weight” were involved, given the nature of the allegations and the vulnerability of the nursing home residents. He also noted that the plaintiffs could be awarded damages at trial and that this would be an adequate remedy. He therefore refused the prior restraint order. However, he did grant an injunction restraining RTÉ from further trespassing pending the trial of the action. Cogley v RTÉ is undoubtedly an important case for press freedom but it is important to be clear about what it says and what it doesn’t say. First, it was a case about a prior restraint order sought on a temporary basis pending a full consideration of the issues. The case did not establish that it is lawful for journalists to conduct secret recordings. Indeed, it explicitly recognised that the plaintiffs could continue to seek damages for the alleged breach to their privacy rights. It also prohibited RTÉ from further trespassing. Second, the Court distinguished between (a) matters that are entirely private to an individual where there is no proper basis for disclosure and (b) information that is not so private but where there could be a complaint about the manner in which information was obtained. This case concerned information suggesting serious irregularities in the operation of the nursing home and therefore fell into the latter category. It is implicit in the judgment that a future Court should be much more inclined to restrain publication of information in the former category. Third, the privacy rights involved were those of people at their place of work conducting a business. Privacy in the dwelling receives a much higher level of protection in the Constitution than privacy rights in general; the Constitution describes the dwelling as “inviolable”. In the recent case of Sullivan v Boylan (No 2), not concerned with journalism, Mr Justice Hogan commented that few things in life were more important than the security of one’s own dwelling. Fourth, the public interest rights in Cogley were of a very high order indeed: what was exposed was significant mistreatment of some of the most vulnerable members of society. Fifth, given that constitutional and legal rights were involved, the Court made its own assessment of the public interest. Journalists do not get to self-certify that their stories are sufficiently in the public interest to justify breaching the legal and constitutional rights of others. In short, Cogley means that the courts won’t grant a temporary order restraining publication where there is a sufficiently weighty interest in publication to justify any interference in legal and constitutional rights. No more, no less. What then is the relevance of Cogley and the broader legal and constitutional principles for the current debate in College? It is difficult to imagine anything occurring in student residences that would involve a public interest sufficiently weighty to allow journalists breach the constitutionally protected dwelling by listening outside student residences, trespassing in student residences, or bugging student residences. To say that such journalistic practices are legally or constitutionally protected is, in our view, a misunderstanding of the law. Neville Cox is the Dean of Graduate Studies and Professor in Law at Trinity. He is also the author of Defamation: Law and Practice. Oran Doyle is Associate Professor of Law at Trinity, and author of The Constitution of Ireland: A Contextual Analysis. David Kenny is Assistant Professor in Law at Trinity, and co-author of Kelly: The Irish Constitution.